This blog post represents the culmination of our research into building a mooring here in Luperon, Dominican Republic (DR). We think that the design and location of our mooring will be satisfactory for us and our 50 ft catamaran as we wait out the 2016 hurricane season. The safety of our mooring, however, is undercut by the use of rebar of unknown origin, Chinese-made steel chain, shackles and swivels, and the proximity of nearby boats. Because we are in the DR, we don’t have access to the breadth of parts available in North America. We would have preferred to have bought components made of US-made steel. Chinese-made steel is reputed to be low-grade, despite what the marketing materials might say. As my husband, Rick, says, “for sure we would have bought [our mooring components] in the US if we had known that we needed to construct a mooring” in Luperon. For the benefit of non-sailors, a mooring provides us with a semi-permanent way to secure our boat offshore in the harbor that does not involve using our anchor or chain and bridle. There are a few ways this can be achieved. My intent is not to describe all ways to build a mooring. This blog post describes the mooring that we built. Had we had access to the parts, we might have considered using something called, “mushroom anchors”. Mushroom anchors are not available to us in the DR, but we could possibly have used old engine blocks. In Luperon there is one second-hand chandlery. Entrance to Freddy’s chandlery in Luperon. In our search for materials, Freddy’s chandlery and the local hardware store had smallish chain, shackles and swivels available. But, they could not provide us with the components suitable for our boat. Consequently, we made several trips to Puerto Plata and Santiago to investigate what was available and to buy materials. A couple of factors led us to believe that we needed a mooring. First, we learned by talking to other cruisers that the Luperon harbour would be hard on our ground tackle (anchor, chain, swivel and bridle). The Luperon harbour is thick with silt, and barnacles grow quickly. Our anchor chain is encrusted with barnacles after two months in Luperon Harbour. Our anchor bridle also looks worse for wear, and needs cleaning. 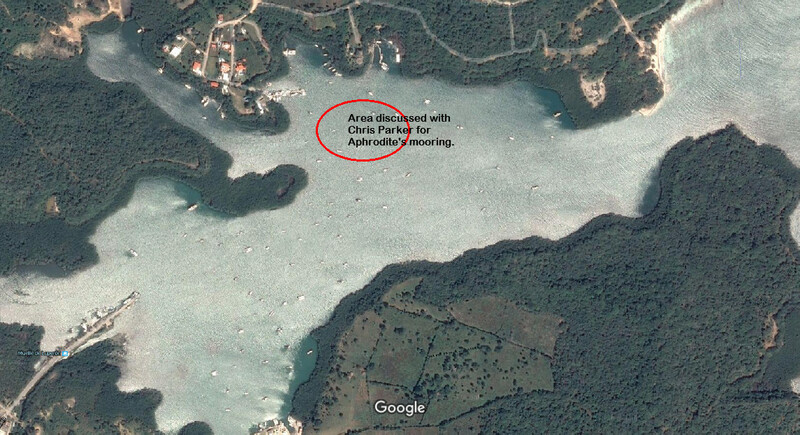 Another compelling reason to get a mooring was seeing that several boats on for-hire moorings had dragged. In fact, a few weeks ago, we watched a boat drag across the harbour. The boat that dragged was on a rented mooring, anchored to a concrete-block. It is interesting to note – and something I learned from my husband who has a background in space physics – that concrete weighs less in water than on land. The simple explanation is that concrete is affected by buoyancy (just like everything else), but concrete blocks are large so they displace a lot of water. Blogger and PADI Instructor Chris Sullivan describes this phenomenon in greater technical detail in his blog post, “Buoyancy of Concrete“. Watching the boat drag across the harbour made us leery to use an existing, for-hire mooring. We weighed our options and determined that we’d be best to build our own mooring. Other than the engine blocks mentioned above, we considered anchoring ourselves to the sea floor with concrete blocks or an anchor screw. We decided on the anchor screw as being more permanent, knowing the boat that dragged was on a concrete block mooring. One negative we had heard about anchor-screws was that they could work loose over time. To combat this we decided to use three anchor screws arranged in a triangle. We had our three anchor screws constructed at a local welding shop. The screws are ten foot lengths of 1″ diameter rebar with 1/2″ thick 24″ diameter steel augers welded to one end of the rebar and a bent rebar ring welded closed at the other end. These anchor screws are then screwed into the sea floor by two divers until all the remains above the sea floor is the ring. This image shows approximately what our anchor screws looked like; ten feet tall with two 24” diameter augers. We unfortunately lost our photos of our actual anchor screws when Rick’s phone was damaged. Our anchor screws looked similar to the one shown above. One hurricane that ravaged the North Atlantic Coast swept through an anchorage in the New York area and tore almost every boat from its moorings. Only two survived. What these two had in common was an “unconventional” mooring system – three anchors bridled to a common center, with chain and pennant leading from that center point to the boat. So, this is what we decided to build and what drove the design plan for our mooring. The cost for the extra two screws was only about $175 more than for one. Rick spoke to other cruisers as well as the service boat operators in Luperon Harbour. Rick also sought input from our friend, Dave Houston. Dave is an experienced sailor and former owner of the St Francis 50 catamaran (O’Vive). The initial design plans were vetted by industry expert, Pat Reischmann. Rick also received input from Greg Kutsen of Mantus Anchor. 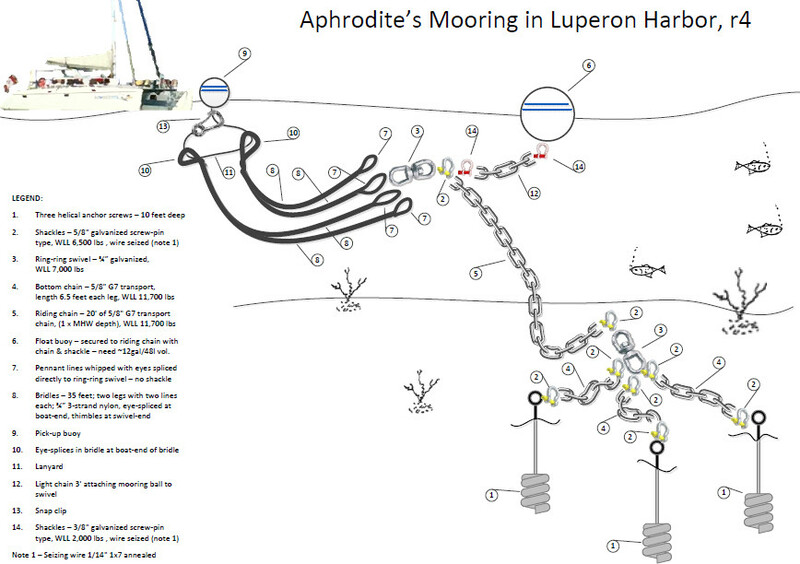 Below is the finalized plan of Aphrodite’s mooring that Rick created using Visio. The same plan is available in PDF format here. trying to find materials in a foreign language – most people speak Spanish, but not English, in the DR. Rick sometimes relied on his taxi drivers to act as interpreters. In one case, a taxi driver and salesperson insisted 3/8″ G30 chain was sufficient for our boat. G30 is a general purpose chain, and would have been totally unsuitable in the 3/8″size that was available. Nonetheless, the taxi driver and the chandlery sales people were adamant that, “that was what all the boats here are using”. If that’s true then that’s a scary thought. We didn’t buy the G30 chain. trying to get properly sized chain – we eventually had to settle for 1/2″ G7 transport chain with a chromate finish. G7 chain is exceptionally strong and it will be good for many years, but it won’t last as long as it would if it was galvanized. buying rope line for the pennant – Rick wanted 1″ or 1.25″ line, but the stores would only sell a minimum of 300′ for about $2,500 USD. We only needed 60′. This is why we settled on the rather unconventional approach of using two pairs of bridle lines of used 3/4″ line. The happy news is that we were able to acquire all of the materials that we needed here in the DR. The following video captures the components of our installed mooring as they appear below the water. At times in the video there are glints of red on the chain. This is the reflection of our camera’s red “recording light” reflecting off the chain and shackles. As I mentioned, the video shows the components that will lurk beneath our boat. The part that will be visible above the water – the parts that attach to our boat – consist of a ring-ring swivel, and a bridle. In preparation for the bridle, Rick spent three hours smoothing the ring-to-ring swivel with a Dremel tool. He wanted to be sure to minimize chafe between the lines and the metal. Here is a picture of Rick at work, smoothing one end of the swivel with a Dremel tool. Actually, he started with the Dremel then switched over to his more powerful drill. Rick at work on our transom (back of the boat), smoothing the part of the swivel that would be in contact with the pennant lines. Paul (age 8) looks on. Here is a picture of the finished swivel with the lines attached. These lines are called pennant lines. Pennant lines were whipped to reduce chafe and spliced onto the swivel. The pennant lines form a bridle. The bridle acts like a set of reins for our boat. The bridle offers stability and prevents the boat from twisting around in the wind and waves. There are two ends to the bridle, which Rick refers to as “legs” in his design plan. Here is a picture of one side of our bridle that will attach with an eye splice (loop) to a cleat on our bow. One end of our bridle ready to be attached to a buoy and put in the water. So far the design – both below and above water – looks pretty robust to us. But, we felt it was important to consider the optimal location for our mooring in the harbour. Hurricanes would likely approach from points south, south-east or east. Hurricanes approaching from the south would likely be deflected to the west by the mountains before reaching Luperon. In this case, we would experience winds from the east, but they would be reduced somewhat by the mountains. If hurricanes passed by us heading to the north, to the north-west or to the west then we would likely experience winds from the north, north-west and west. Based on the above, it is my understanding that it would be best to construct our mooring on the north-western side of the harbor, rather than the eastern side. A picture was sent to Chris Parker, similar to the one below. Luperon Harbour. A similar picture was used as a discussion point with weather expert and sailor, Chris Parker. Yes, you are absolutely correct. Strong winds with a Hurricane would tend to blow mainly from N & W directions, with lesser winds from other directions possible depending on the track of the LO. From Chris’s reply we determined that the optimal spot for our mooring was the north-western side of the Luperon harbour. With the help of “Handy Andy” who operates one of the service boats in the Luperon Harbour, we chose a spot for our mooring. Water depth was measured by traditional methods – dropping an anchor and measuring the rope required to meet the sea floor.The water measures between 18-20 feet deep in the area that we installed our mooring. A depth gauge would have been useful, though not essential, for this activity. I should like to note that our riding chain is 20 feet. Rick would prefer that the riding chain be 30 feet, and may consider adding more chain later. A longer riding chain is more in line with the recommendations found online and elsewhere. But, bear in mind that we are close to other boats in the harbour, and we do have 50 feet of chain and bridle between the boat and the sea floor. We expect that this construction will last for several years. If we had had access to US steel products then our mooring would have been built to last longer. Our weakest link might be the anchor screws, made of 1″ rebar at the local machine shop in Luperon because the strength and origin of the steel is unknown. We were surprised to learn that the shop had never been asked to completely close the loops at the top of the anchor screws. Before we asked them to weld the loops closed, there was at least a 1″ gap remaining. Surely this gap would allow a chain to slip from an anchor screw? We wondered about the safety of other moorings, and were glad that we asked to have the loops closed on our anchor screws. All of the parts for our mooring were purchased in the DR. The total cost including parts, labour and three taxi trips to Santiago and Puerto Plata was $1640 USD. While this may seem steep, we plan to stay here until the end of November 2016. The cost for the remainder of our stay works out to p$14 USD per night. Our intent is to sell our mooring to another cruiser who is staying long-term in Luperon. While it would be interesting, we have not priced out what it would have cost us to buy the parts in the US. Many thanks to Handy Andy and his amazing team for installing our mooring and helping us see this project through! I have had my mooring break twice. Once when another boat broke its mooring and got tangled up in mine and chafed through the top lines. My boat ended up on the beach with about $10k of mainly cosmetic damage. The second time was just in January. I had sailed her home 180 miles from our Xmas holiday, and had put her on the mooring on a very calm night. The next morning I got a phone call asking if I was on board my boat? (I was still fast asleep at home recovering from the trip!) she was drifting slowly back IN to the bay… who knows where she had been or for how long. Dragging all her chain around, the shackel pin had gone. Thank goodness it was a calm night. A lovely power boater rescued her and towed her back to the jetty and just as I arrived the wind picked up. Hope none of that happens to you!